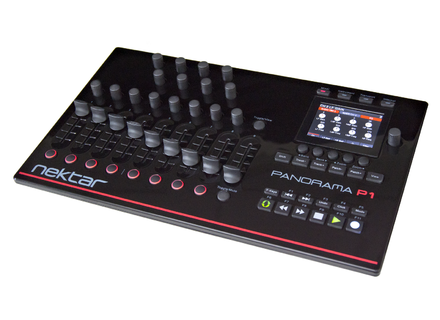 Panorama P1, Other MIDI Control Surface from Nektar. Nektar announced a new USB controller surface with deep integration for Cubase and Reason, the new Panorama P1. 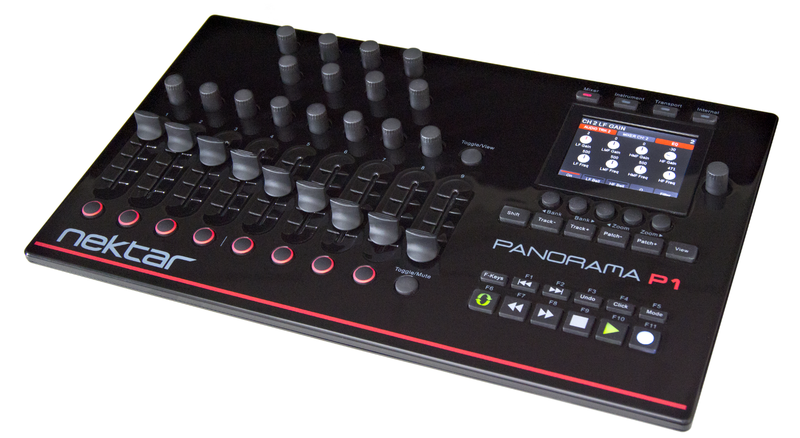 Like Nektar's Panorama P4 and P6 USB controller keyboards, the Panorama P1 features generic MIDI controller capabilities that allow operating any DAW. The Panorama P1 features the Nektar QWERTY macro support. Up to 8 keystroke commands can be sent to a DAW at a push of just one button giving you access to DAW functions and menus not normally available via MIDI. QWERTY macros can be assigned to any assignable button including the 11 F-keys which in turn can be stored as one F-key map to any of the 10 F-key map locations. In addition, Panorama P1 also has 20 preset locations for use in Internal mode with each preset storing the P1 controller assignments for generic DAW or MIDI hardware control. The Panorama P1 features nine 45mm faders, 16 endless encoders, 8 LED buttons, 11 transport buttons, 22 Navigation buttons, 11 F-keys buttons, 1 assignable footswitch socket and a color high resolution TFT display. The Nektar Panorama P1 will be available in April 2013 with an RRP of USD 299.99/ Euro 259.99/ GBP219.99 in stores worldwide. More info soon on www.nektartech.com. [NAMM] Orange upgrades the OPC amp and computer Orange announces the third generation upgrade of the OPC guitar amp and computer, which will be on demonstration at Winter NAMM 2013. [NAMM] Steinberg Cubase iC Pro for iOS Just in time for the NAMM, Steinberg launched yesterday a new Cubase remote control application for iPhone, iPod Touch and iPad called Cubase iC Pro.